Thats right, it’s a verb. I had the pleasure of hitting up about a dozen garage sales this weekend with Katie from Nerdy Girl Writes. 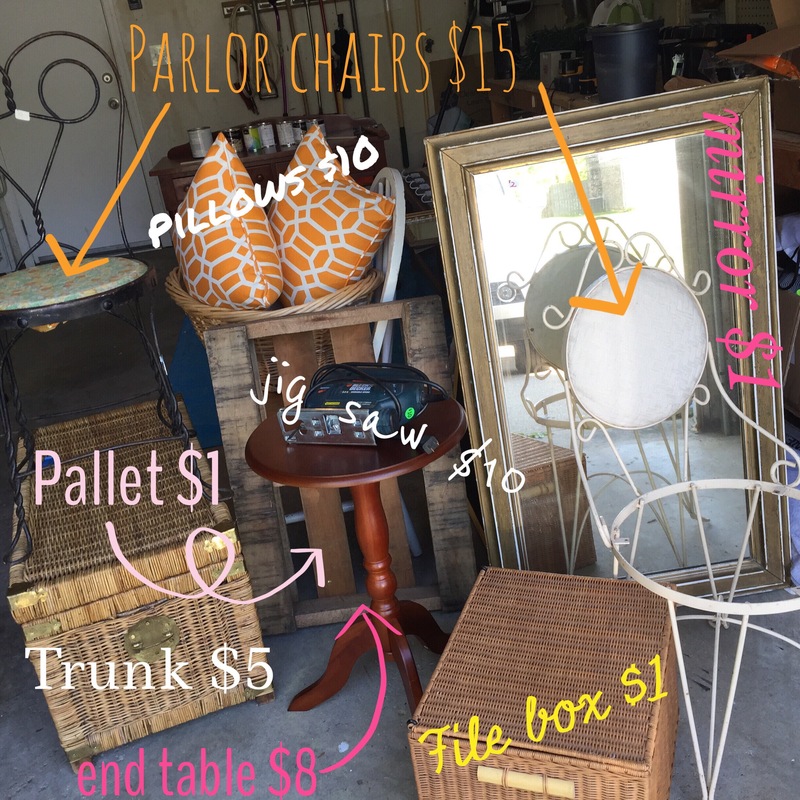 We met bright and early, coffee in hand and headed out into garage saler’s paradise. 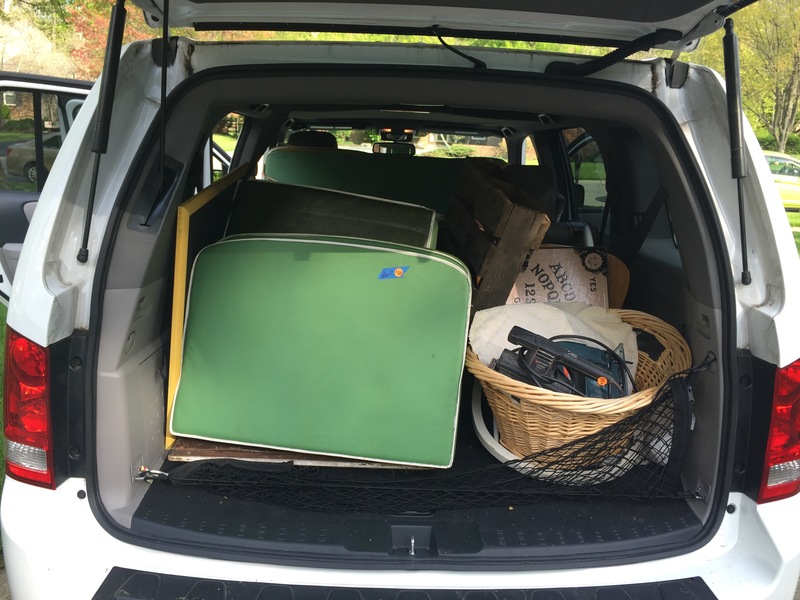 We filled our first carload before 9am. And my car is pretty roomy. 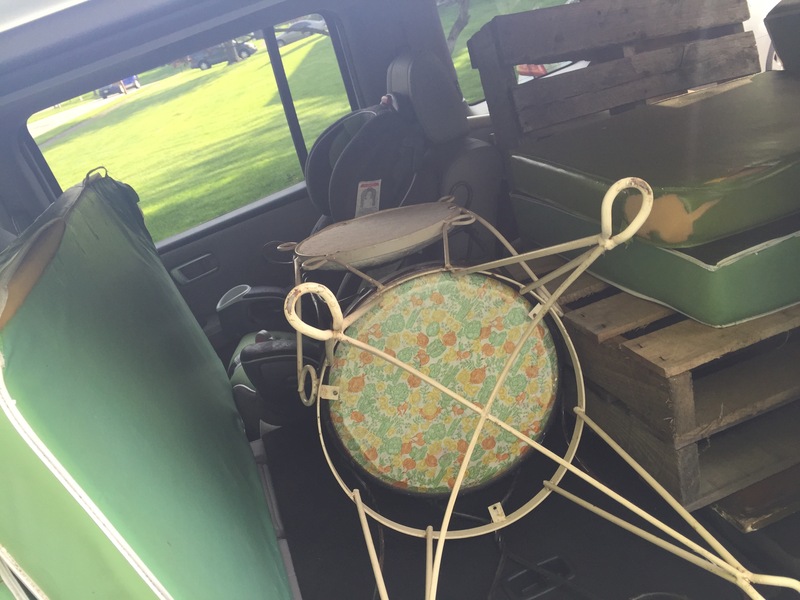 Katie scored an entire vintage patio furniture set and a solid teak adirondack chair and ottoman for less than $50. She also scored a ouija board fkr the purpose of framing as graphic art. I’m kind of jealous. I’m sure she’ll be posting all about it but I have to admit I was impressed. That girl can negotiate! We made a few trips back to my garage, her car and her garage as well as swinging by and borrowing a car for more cargo space. Between the 2 of us we filled 5 car loads. But the patio furniture was easily 3 loads alone. I’m so pumped about the icecream parlor chair I scored. The pillows are outdoor fabric so they well be going on out deck. 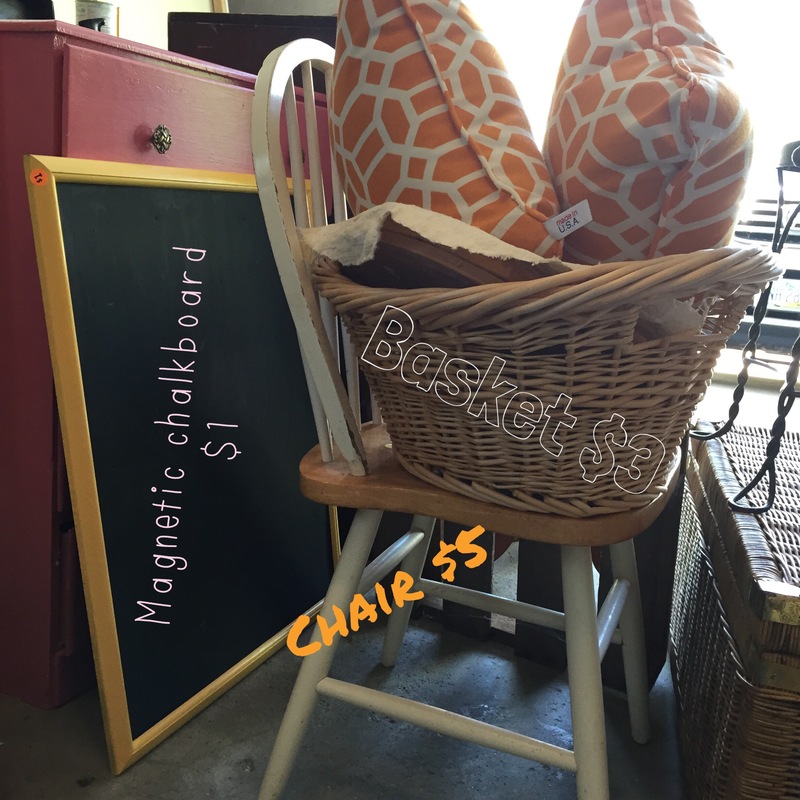 Liv will love the magnetic chalk board and the wicker trunk as soon as they each get a coat of paint. The smaller wicker box is actually a file box. 1 was relieved to find this because I have out plastic one and haven’t found a cabinet or anything I like for the same purpose. I’m also excited about the jig saw. Every DIY girl’s dream. Haha! Everything else will likely be redone and sold on my Facebook page or etsy shop. I’m not morning person but I will say that this was a Saturday morning (and like $65) well spent. 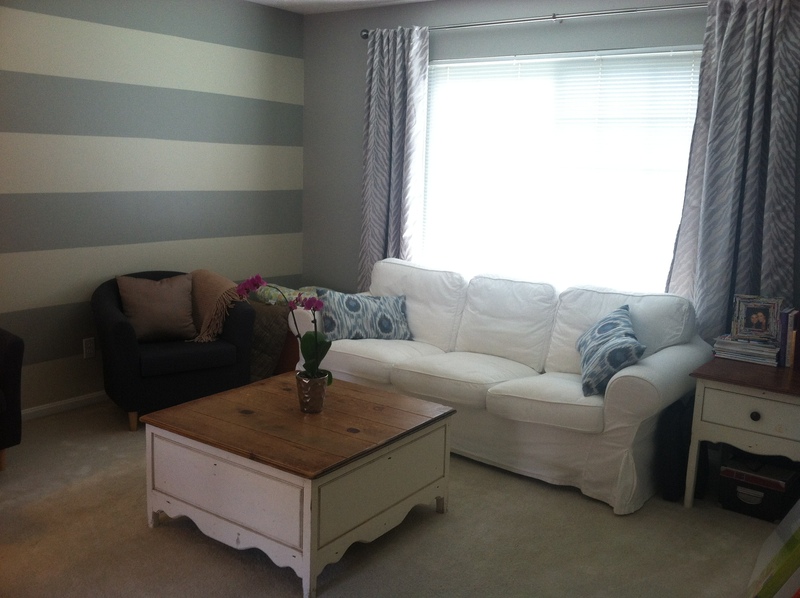 My sister and I took on a fun extra project and helped transform three rooms for a friend. First we gave Sam a pirate themed room, then Jack got a sweet new baseball themed room. 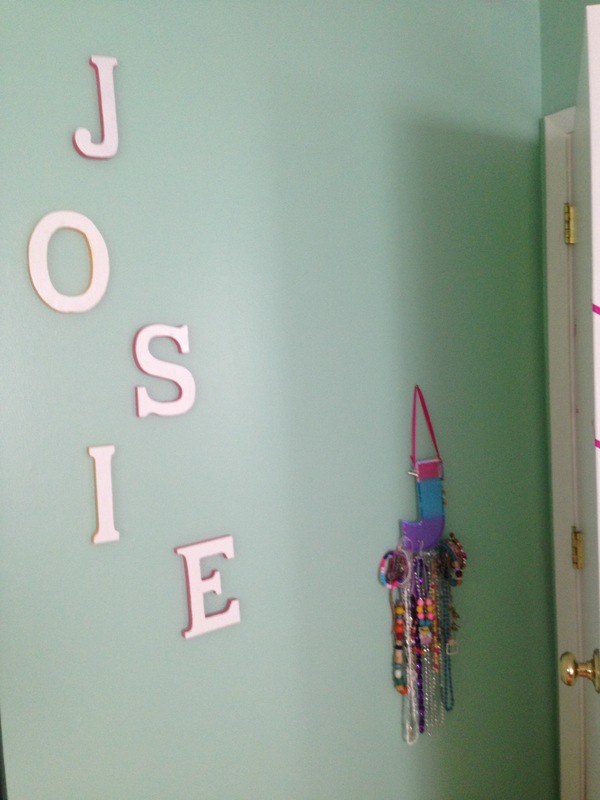 Now we present Josie’s room. Josie is all girl in every way. She loves dress ups, dolls, books, fairy tales, penguins and pink. 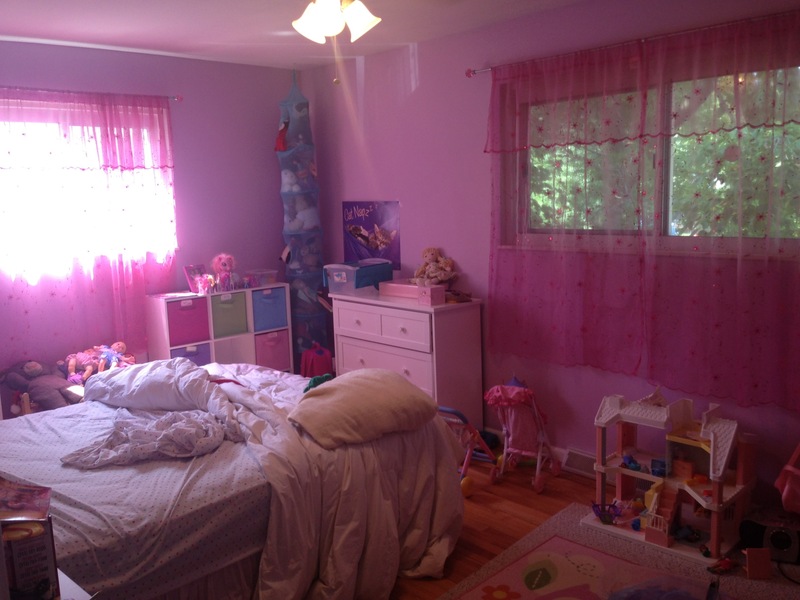 Her mom, Heather, hoped for more order to her room including all of those dolls and dress ups. 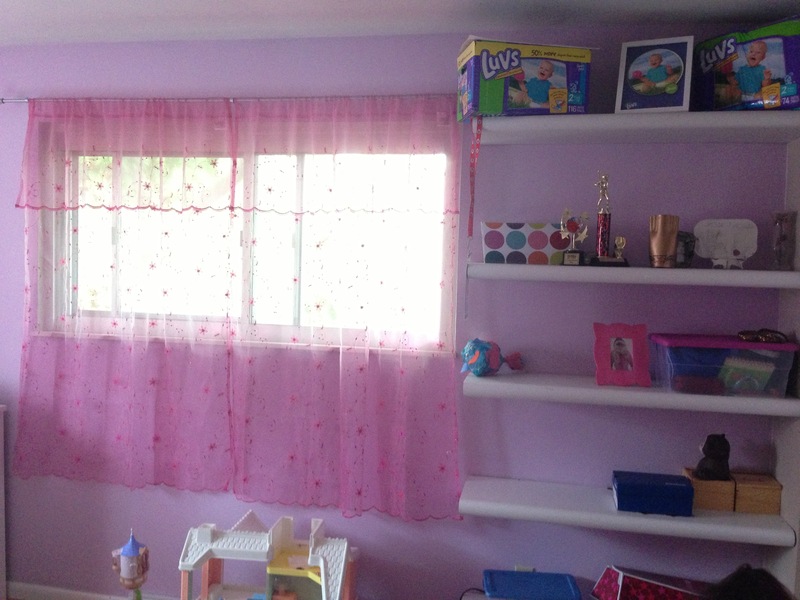 As you can see from the pictures above and below, Josie has tons of dolls, books and toys that needed a little corralling. Susie and I would have to be pretty strategic with how we organized this room. We wanted Josie to be able to reach everything as well as put it all away when she was finished playing. 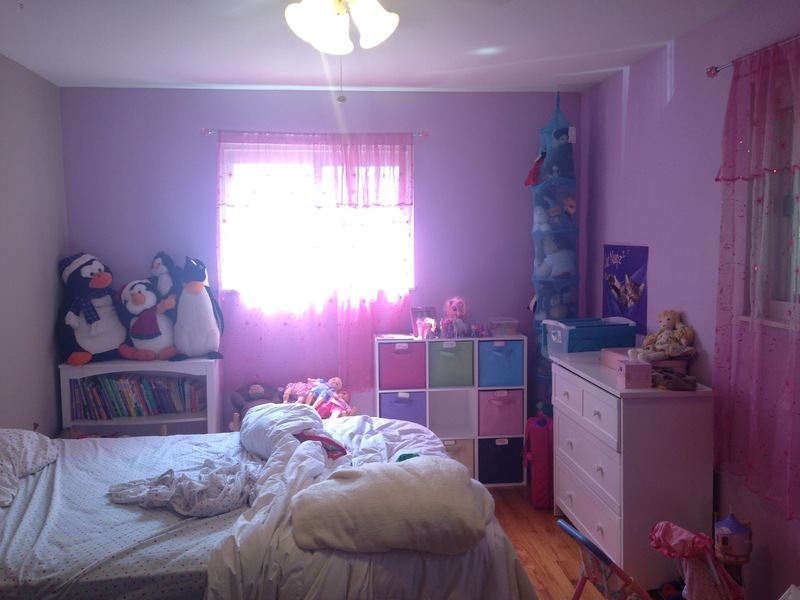 Her room had two soft pinky (and sometimes lavender looking) walls and two beige walls. Heather told us she didn’t love the colors. Josie handed me a handwritten list of things she wanted to see in her new room as well as a list of things she liked and disliked about the current room. 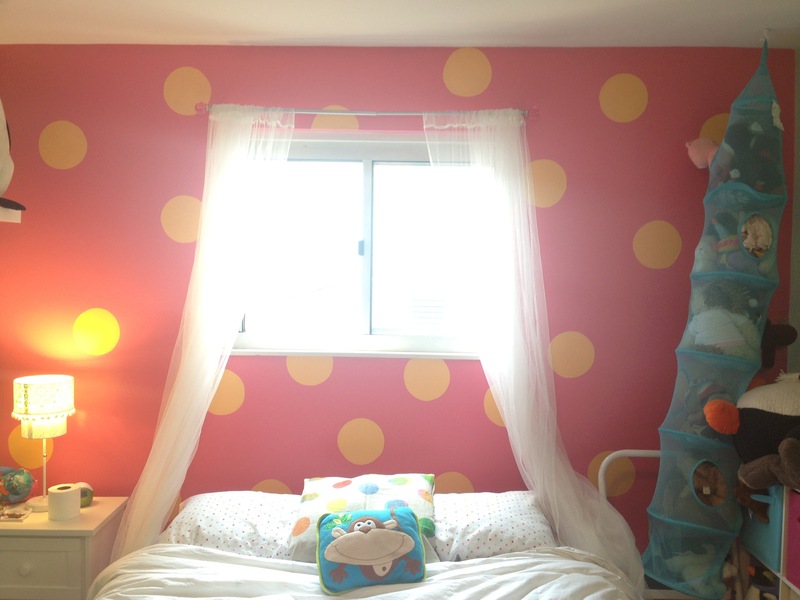 She wanted a reading nook, loved her windows curtains, loved her sheets (bright and cheery polkadots!) 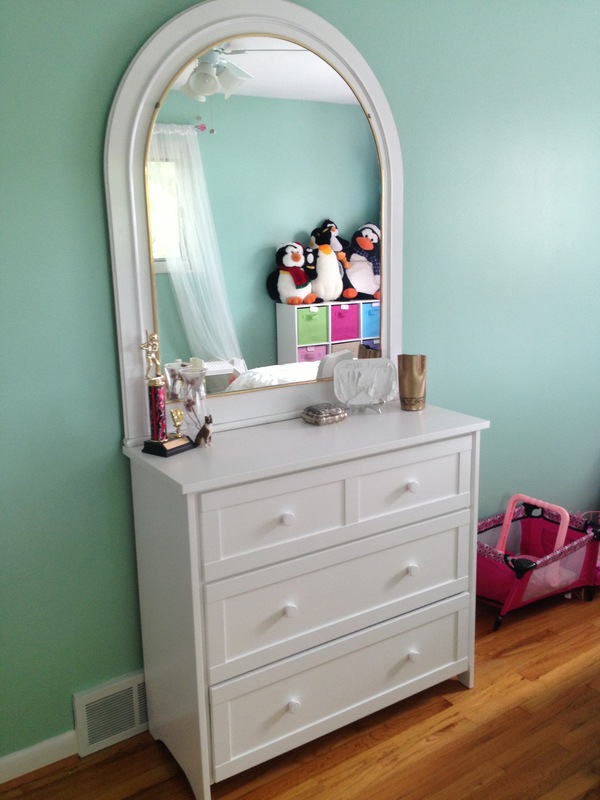 and she wanted a mirror and place for her dolls and penguins. We also had to remove more of those built ins. And see that Luvs Diaper box up there? Josie has long outgrown diapers but she was once the face of Luvs! She told us to get rid of that box… her mom had some framed images from the Luvs days instead. We gave Josie the mirror she wished for. It was a $5 yard sale find that just happened to fit her dresser perfectly. We spray painted it white and attached it with a few screws since the mirror already had the mounting hardware with it. We kept Josie’s letters from her old room but gave them a fresh coat of white spray paint and painted the edges to coordinate with the accent wall. Josie had quite a bit of jewelry so we recycled the “J” wall hook from her old room and relocated it to behind her door. This way she could sort of “stash” her jewelry out of sight and it was still close to her closet. Josie got her reading nook too! We found this sweet little wooden swivel chair at the same yard sale for $5 and gave it a coat of white spray paint. So fresh! The pink “dot” cushion is from Ikea. Susie organized all of the books and styled up the bookcase with some of Josie’s keepsakes. We tucked the chair in the corner and book case under the window. Ta-da, Reading nook accompished! We found white mesh curtains at Ikea. Josie had wanted to keep her pink ones (and we did too!) 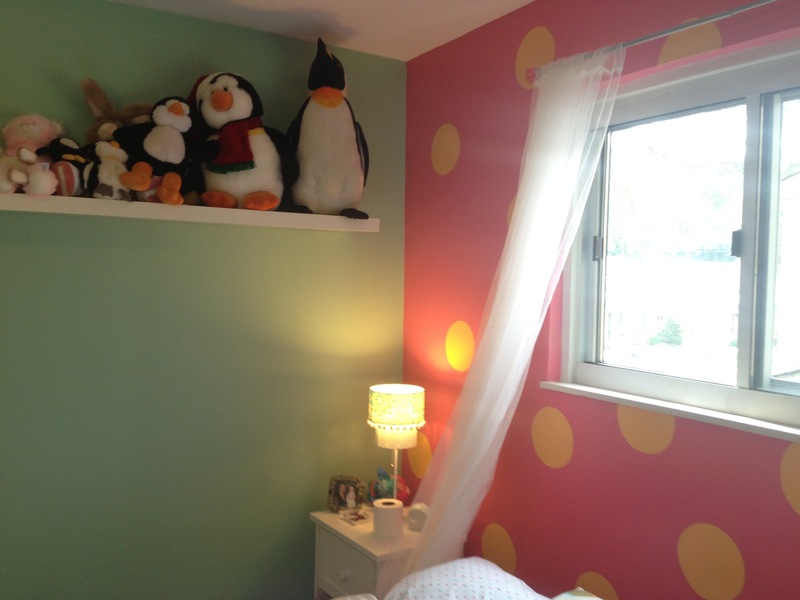 but once we painted the pink wall, they completely clashed with each other. 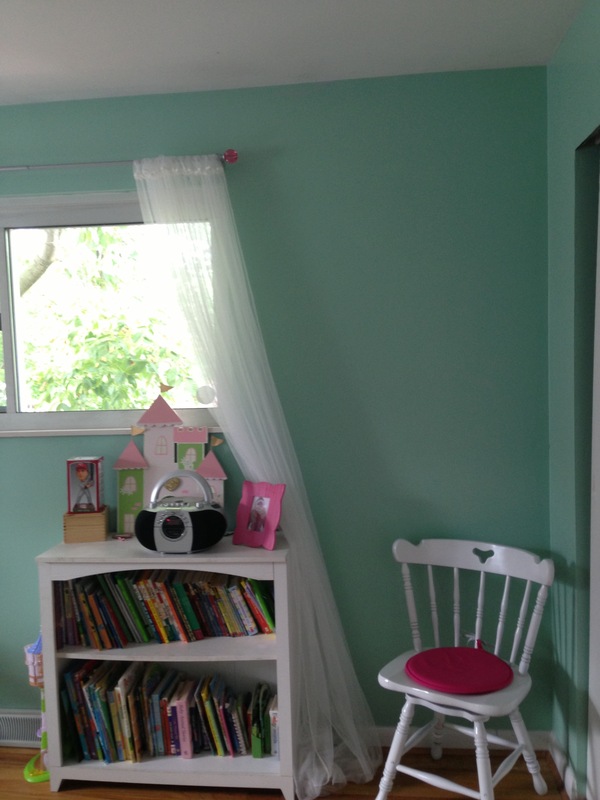 The white is a little more grown up and will hopefully extend the life of this room into tween years anyway. Ah, the pink wall. This is the first stage of the accent wall. I’d have to come back later to do all of the polkadots. 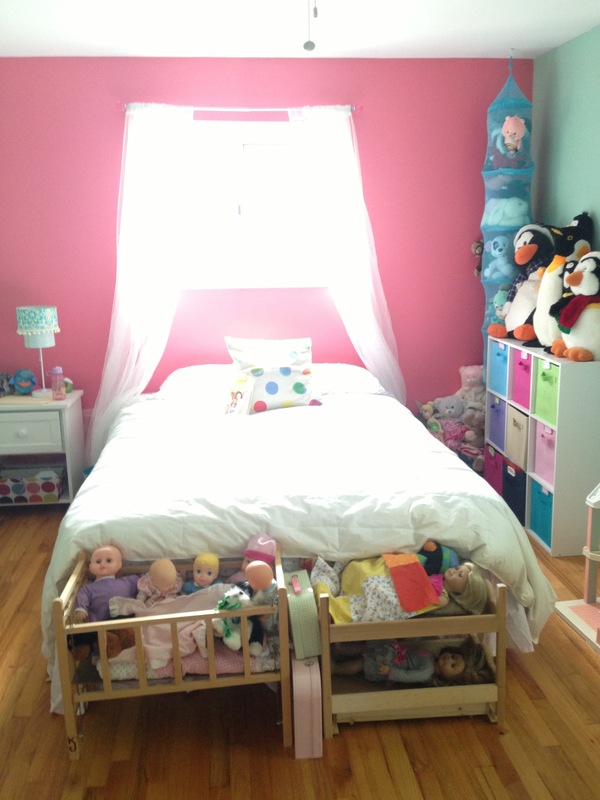 But you can see how Susie used the space at the foot of the bed to make a home for the baby doll cribs and accessories. Josie already had the cubbie storage unit so Susie just made sure all of the baskets were pout to good use and we added some of he stuffed animals to the top as well as keeping her hanging stuffed animal storage from before. We came back one evening to hang Josie’s 6ft Ikea LACK shelf. 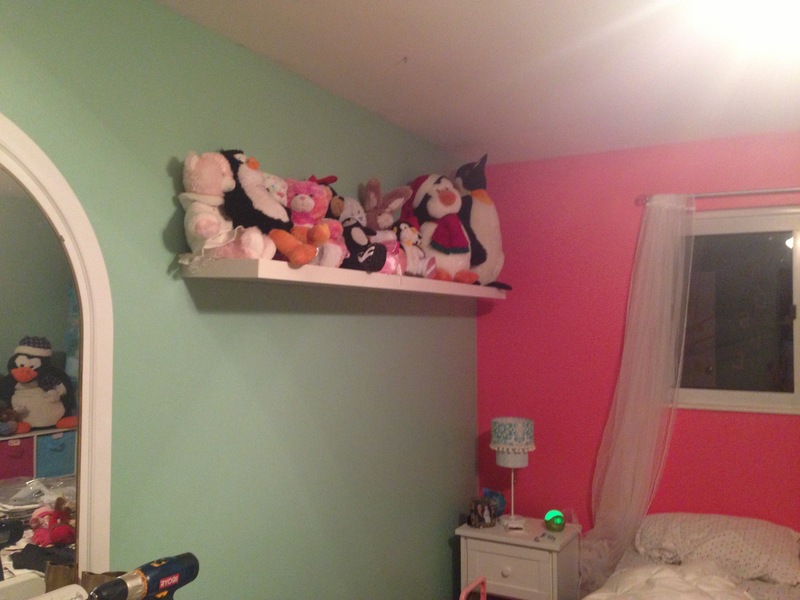 We wanted to give her more stuffed animal storage, but its also in a place that she can use the shelf for books or keepsakes in a few years too. 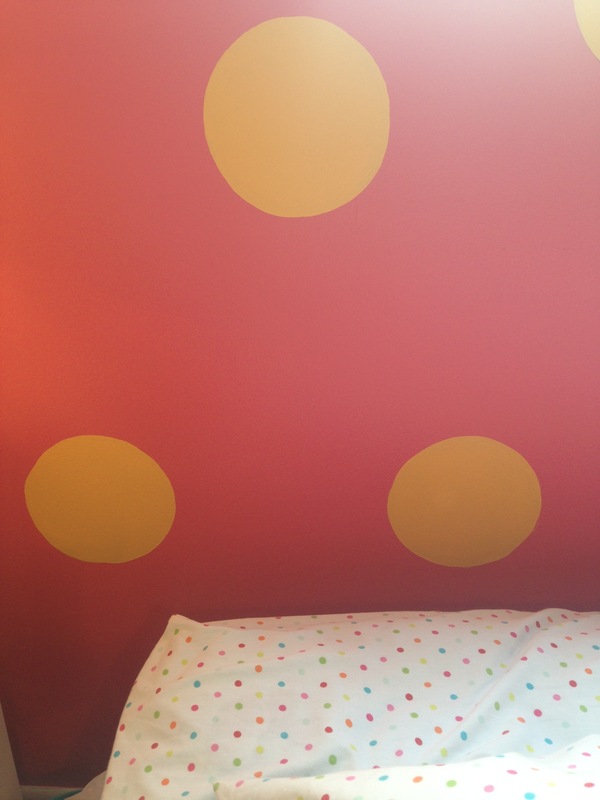 Stage two of the accent wall: polkadots. I traced a cookie tin (What? It was the perfect size!) and painted two coats of the yellow. The pink is Behr “Hot Gossip” and the yellow is Behr “Cheese puff” both in Satin. Another view. I like all of these colors together. They are so happy! I think this room is much more “big girl” than before. Here is a better look at the dots with the inspirational sheets. We moved Josie’s bed under the window to give her more space to play. Before, the bed gave the feeling of cutting the room in half. But now you enter the room and are greeted with more space and easier access to things on both sides of the bed. And its all visible so things should be easy to find too. Our solution for storing the dress ups was to get a couple of under the bed storage containers. 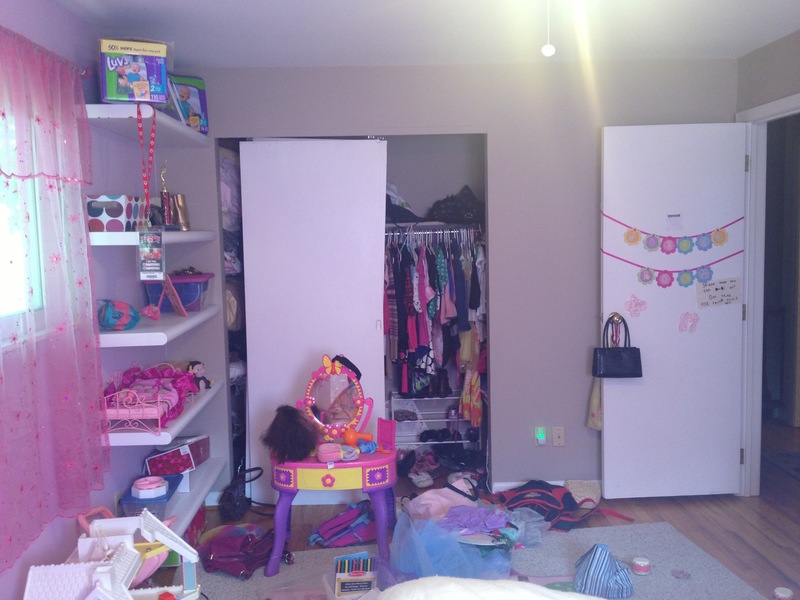 We also moved a couple of the larger toys to the basement (like the dress up vanity). 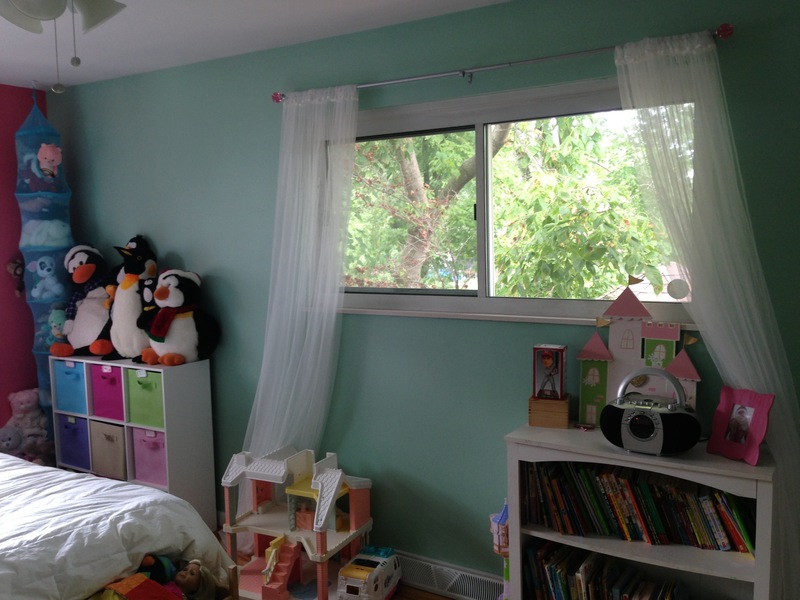 Josie is happy with her room and her mom reports that keeping it clean (and getting the kids to clean up their rooms) is a lot easier than before.